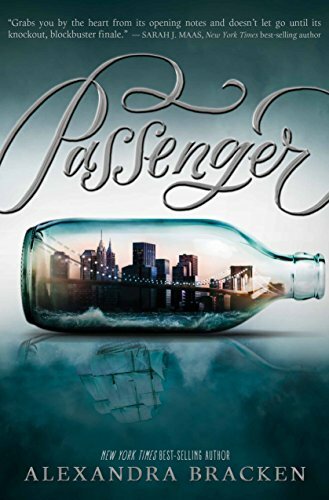 It's interesting, the reviews for Passenger have been decidedly mixed, and as I mentioned on Goodreads this weekend, I think the criticisms of this book are legit. This novel is not fast, there are a lot--I mean a whole lot--of details that may or may not be of interest to you. (So many clothing details, you guys! You know how that's my jam!) There's a romance that happens fast, really fast. And there's a certain distance in the narrative that may frustrate you if you loved the Ruby's voice-y narration in Bracken's Darkest Minds series (I loved that series!). And yet, it all worked for me. I think this is because the pieces all felt very sweeping and epic, so I was able to set aside issues I'd normally have. So here's the deal with Passenger: It's the first in a duology of novels about Etta, a violin prodigy who's unwillingly pulled into another time thanks to a long-standing feud between families. She lands on a ship in pre-Revolutionary War America, where she meets the Nicholas, a sailor who values his freedom from the Ironwoods--the powerful family that's responsible for Etta's capture. Ultimately, the pair races against time across centuries and locations in search of an object unbelievable value that may give the Ironwoods absolute power over time. That's the crux of the story, and it's a whole lot of fun. I really dig time travel stories, and while I get annoyed when the explanation of the time traveling is hand-waived away, when characters actively time travel, it's like catnip to me. The ending has a pretty big cliffhanger, so be forewarned if that makes you crazy (I'm kind of okay with cliffies these days), but the journey is a whole lot of fun. I dug the clothing descriptions, I know I'm probably in the minority here, but that stuff is my jam. I just think that's a great marker of time and place that works in novels like this. The big bad is super evil, plus warring families--come on, I am powerless against that sort of thing! Boats! Guys, I am obsessed with books on boats, so even though it's just the first section of Passenger that's set on a boat, I'll take it. On a more serious note, Nicholas' point-of-view is fabulous--in fact, I enjoyed my time in his head more than Etta's, which is unusual for me. He wrestles a lot with moral dilemmas and thinks a lot about preserving his place in a world--regardless of time--that's not welcoming to him. With Passenger, I definitely think your mileage may vary wildly depending on your tastes. IF yours are like mine, you'll probably want to pick this one up.